Agencies wishing to augment in-house capability are welcomed at the Digital Deli. There are tens of thousands of jobs to be done by creatives across the globe. Just like you, we realize there is always a big step between being creative and getting the job done. The Digital Deli built what we call a technology, media and communications superstructure from the ground up. Agency Partners can leverage core digital services like one might pull just the blades needed from a Swiss Army Knife. It frees a lot of creativity by not having to worry about complexity. The Digital Deli Pipeline interconnects core services to harness speed, efficiency and quality that might be cost prohibitive to achieve otherwise. The old technologies that stifled advancement were replaced. The Digital Deli's hub and spoke architecture opens the door to leveraging the future unfolding in our digital world. Agency Access is not for everyone, just creative strategists serving diverse Markets / Industries Served who want to brighten their world with the help of a trusted B4B partner. Agency Access Partners are ones that have a project needing one or more digital services to support a client project or in-house marketing and communications efforts. Agency Access Premium Partners are ones that use one or more Digital Deli Solutions, Strategy and Brands, along with their own expertise and special knowledge, to power client projects in a productive and collaborative manner. Are you ready to open the door to the future with a trusted technology, media and communications partner? Contact Us and tell us about your ingenious collaborative ideas to see if we are a good fit for each other. Tell us about your project, concept or vision. Describe the: mood, visual theme or overall effect desired; Scale and scope of overall project; central point(s) of focus; typography, iconology, graphics; digital image capture needs; vision for on demand interactive engagement; unique project challenges; overall goals and objectives. The World Heritage Bicentennial will invite international and domestic visitors to this year long celebration. Our organization would like to expand our digital footprint to promote tourism, recreation and greater appreciation of cultural landmarks and pristine natural resources. The Live Labels Scenic Geo and Heritage markers that provide the "reward" of interactive on demand engagement are perfect. We'd like to have 50 in place by July 1st with an option to complete the remaining 200 landmarks. Provide a turnkey package for production, design, media, licensing, development, smART Code programming and secure Internet provisioning. Location and site information has been compiled. The short Edu-tainment Multimedia for Your Mind format is exactly what we want to enhance our visitor experience. Incorporate Calibrated Advanced Digital Image Capture services for Digital Preservation requirements using the 4 axis method when practical and feasible. Retain calibration and raw source data to consult on color matching and defect restoration, as may be needed. While a digital mobile experience is foremost, an ecosystem expansion into regional visitor centers is a logical next step. Having Digital Deli Studios™ transcode for large format visitor displays and render the content using Reactive Internet Multimedia on Gen-3 Cloud makes a lot of sense. The reuse of media and elastic Cloud expansion capability from the Digital Deli saves time and money, making Phase II and III even more cost effective. Ship materials FOB our corporate office for staged release June 1. Activate Edu-tainment Multimedia "rewards" on Gen-3 Cloud June 21. Time Frame: start now, finish July 1. Digital Portal activated until Dec 31st, with annual renewal. Our small town just off the Blue Ridge Parkway is filled with legends of Daniel Boone unknown to most but the locals. The Digital Deli micro-portal sounds like a tempting option for us to monetize our history. We have the geospatial coordinates, the stories and reference information recommended. Now we need this packaged into 3 edu-tainment multimedia segments. While 4G-LTE cell coverage has improved, consulting help to get a small mesh network up and running is an excellent solution. Nice that we can start small and evaluate our ability to attract new visitors using these digital technologies. The National Park Service has agreed to place a sign on the parkway to help promote this nearby "interpretive exhibit". Our historian would like to digitally preserve 20 rare 2D artifacts (maps, drawings, sketches, letters) that can be used in the multimedia. One interpretive sign using the scratch and weather resistant Amazing Aluminum is needed for the trail entrance. See drawing for size, design concept and interpretive details. It is reassuring to make a small, but powerful digital footprint now and grow into more sophisticated digital services using the same trusted partner. Require: 3 edu-tainment multimedia productions (2-3min), digital preservation service (20), geospatial plotting, smART Code programming, (1) interpretive sign, activate micro-portal for Daniel Boone Crossing on Gen-3 Cloud with annual renewal option. Time Frame: complete by May 1st. Home, recreation and outdoor national retailer is bring a new brand of Smart Fabric across the entire line. We need over-the-top media produced with models wearing and using the new "on location" outdoors to support rollout at 54 stores. The outdoor line includes: tent, sleeping bag, packs, boots and outdoor clothing. A four season rollout: spring, summer, fall, winter is needed. Using the same models, at the same place during different seasons would be perfect. Preparing year 2 media using a diverse mountain and coastal landscape is a go. The revolutionary nature of these new fabrics that change properties needs the visual magic captured, as well as the essence of the experience framed. Keep that in mind for an edu-tainment multimedia production we would welcome. As you say, "we need to sometimes let the brand unfold to capture it's essence", so use your good judgement. Time Frame: start now, complete by Dec 31st. The Community Health & Wellness Center has broken ground. As you said "a visual and spatial theme that flows from once space into the next creating a warm, comforting environment", is our goal. Please consult and collaborate with our design committee Chair to finalize designs and furnish all finished room displays. Scope: 3 main rooms, 4 offices, lobby - see drawing. Time Frame: FOB March 15. Digital Deli Studios™: mixed media lab provides image, video, audio and geospatial services for exact project requirements. Reactive Internet Multimedia: used to render any type of content, on any device, with full media support using an HTML5 responsive framework for: Internet sites, digital portals, micro-sites, embedded applications. Gen-3 Cloud™: Digital Deli Cloud™ solutions include: Infrastructure, Platform, Software and Function as-a-Service to meet any modern requirement. Turnkey Solutions: design, develop, deploy, host, deliver. Communications directors, event planners, festival organizers, advertising agencies, public information officers: Serverless Gems require no domain registration and use secure encrypted SSL to deliver your message (content) for any time period needed from a single day to annually. smART Interior Fine Art™: Interior Designers, Architects, Visual & Spatial Designers enjoy an exceptionally high degree of creative control for precise signature fit and finish designs with exceptional ease. Specify every part of your interior display design in your own project gallery and when you are happy press one button and it is on its way. smART Advertising / Marketing Media™: rights ready and commercial cleared professional media custom curated and produced to exact spec including typography, graphics, branding at Digital Deli Studios and Print Direct Worldwide™ global fulfilment. Gen-3 Cloud™ | CDN, transcoding, content rendering, portal and beacon provisioning. smART Event / Exhibit Media™: high quality commercial cleared media customized for high profile events: 1-13 days and exhibits 14+ days. Mix and match digital services and change content daily to match event schedule. smART Media for Public Spaces™: designers with a special flair for siting and conceptualizing art for public spaces have media, design and fulfillment at their fingertips. Just add creativity and mix for another stunning design. 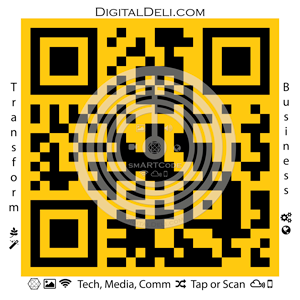 Integrate Digital Deli smART Code™ technology, a digital portal and your customer could adore your brilliance forever. Behind all of the wizardry at the Digital Deli we are really Storytellers that harness technology to facilitate the effective transfer of information in the digital age. We understand IoT, M2M, AI, Cloud and know how to leverage it. There are countless things you can do to "enable your world", but we focus on the things that matter. We also know there are many Creatives itching to brighten their world, but that it is far too easy to get stuck in technological mud. Premium Partners are the passionate foot soldiers, the storytellers, the explorers and ones with special skills to see over the digital horizon into the future. A collaborative approach allows B4B creatives working together to unlock solutions that might otherwise be too complex or cost prohibitive for one entity alone. The digital Deli encourages perspective partners to familiarize themselves with our Digital Strategy, Solutions and Pipeline. We open the doors to good partners who want to make a difference in their world and have the capability to contribute significantly to leading a project from start to finish with the Digital Deli as your trusted partner. You don't have to be a huge company, but if you are we do play B4B quite well. Premium Partners leave a lasting impression and deliver more solutions using the power of the Digital Deli properties and brands. There is much work to do across the globe, so we call "all qualified hands aboard to lead enrichment and knowledge transfer of our world in the digital age". Qualified partners wishing to turn the digital volume up with Live Labels ∴ M2M™ projects to enable your world are welcomed to Contact Us to see if we are a good complementary fit for each other. There are two partner programs for smART Health Media™: (1) Designers and Creative Agency Partners and (2) Knowledge Transfer Partners (practitioners and healthcare facilities). Digital Deli is engaging qualified partners across the globe. Are you a creative agency or independent designer with a flair for enriching your world using evidence based art in a healthcare setting? Qualified individuals and agencies can earn high visibility representing the gold standard in Cognitive Therapeutic Art, while benefitting communities served. An opportunity to join a world class team with unlimited earning potential. If you would like to take the next step in becoming a smART Health Therapeutic Art™ Partner, Contact us and tell us your geographic footprint and qualifications. Effectively transferring knowledge within a healthcare ecosystem is a core component regulating advancement, as demand for service increases. The three legs of the healthcare stool (patient, provider, worker) determine overall performance. 21st century wellness centered healthcare wraps a secure, protective blanket around the entire ecosystem. If you are thinking: knowledge transfer, instructional media, cognitive Therapeutic healthcare, cloud, mobile, multimedia and interested in the Knowledge Transfer Partner Program, feel free to Contact us. The Technologies of Wellness harness multiple disciplines to support self elevating, operationally efficient, resilient ecosystems that may expand and contract to meet demand. The smART Health Media™ includes: smART Health Therapeutic Art™, smART Health Patient Media™ and smART Health Provider Media™ at Digital Deli ∴ B4B and cutting edge smARTHealth AI™ in development at the Digital Deli Business Innovation Think Tank™ (BITT) R&D lab. Interested in becoming a Digital Deli Creative Agency Partner? Contact Us.